about a week ago my plugins started acting funny. some plugins (ex. duplicate to another image) give me an error when executed. other plugins have disappeared altogether (ex.heal selection). everything else seems to be working as it did before. i made no updates to the software except to add artwork i was currently working on. it just started suddenly..
i have attached the error screen i get when trying to run "duplicate to another image" as well as a screenshot of my plugins folder. i am running GIMP 2.8.22 on windows xp. i have not tried a reinstall yet. I do keep a WinXP SP3 (VM) for a few old applications that only run on it. Normally Gimp 2.8.4 but updated it to Gimp 2.8.22 for this. Does not look like anything amiss here. Have you had any AV issues coinciding with the plugin problem? It is worth disabling the gimp profile to C:\Documents and Settings\"yourname"\.back-up-gimp-2.8 and let gimp create a new default profile. Then try just one or two plugins to check if working. I tried that duplicate-to-another-image.py and it works here. Just be careful. Some of those plugins might be hard to replace if not in your Gimp profile - gmic_gimp_gtk for example. A possible explanation is that the files got corrupted (or have random errors) and this leads to Python syntax errors that prevent registration for recently (re-)installed plugins, and crashes while executing for the older ones. If this is a WinXP system I assume the disk is quite old... Did you run a chkdsk recently? Also compare the files you have to files you download again or retrieve from **old** backups. IMHO you should first check that you disk isn't dying. Find tools that can look at your disk's SMART data. But take some high readings with a grain of salt, some manufacturers use some of the fields in unconventional ways and this produces hair-raising numbers even on healthy disks. Google with your disk brand/model for appropriate decoding. i have not done the check disk since nothing else strange is happening anywhere else except GIMP and nothing was installed..
however i did try the new profile solution suggested above. i renamed my current profile and restarted gimp which created a new profile. then i copied a couple scripts and plugins to their folders and restarted. the scripts showed up and are listed under the "script-fu" tab. Even though the startup screen showed the plugins (python scripts) being loaded the python tab was not created and none of the plugins were available. Quote: ... then i copied a couple scripts and plugins to their folders and restarted. What are you expecting in a "Python" tab? 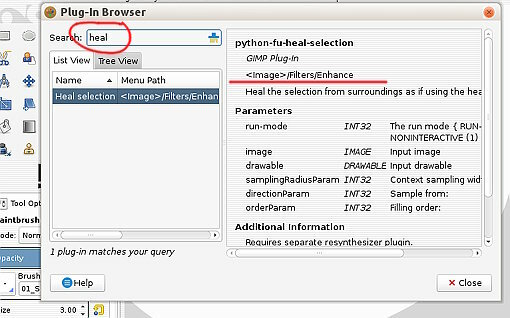 The one shown loading plugin-heal-selection.py registers in Filters -> Enhance -> Heal selection (and requires the resynthesizer plugin to work) The one that crashed previously duplicate-to-another-image.py is in the Layers menu. 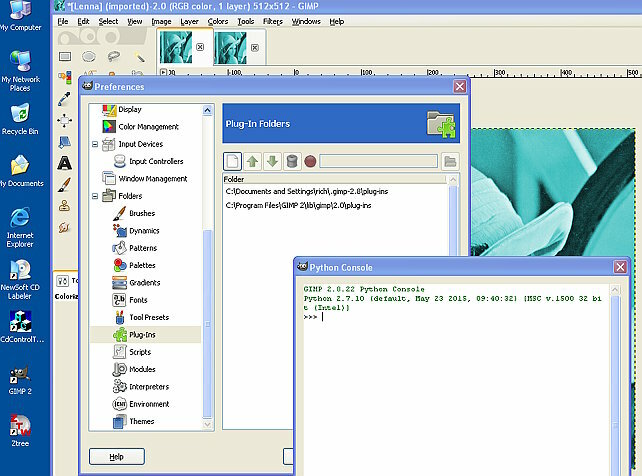 A script or plugin can be anywhere in the Gimp menu system. Use Help -> Plugin Browser to find the menu location providing the script/plugin has loaded. I stick with: a clean Gimp profile, one or two scripts & plugins while you do some checking. You do have an awful lot in the original screenshot. A good time to sort out what is used and what needs dumping. i am sticking with the new (almost empty profile) and i only have one script and 6 plugins in my new profile. i am aware that plugins and scripts show up in different places as far as the menus. when everything was working fine i had a "python" tab with a couple entries. i realize now that i might not have loaded the plug ins that caused the tab to appear?? as far as the plugin browser i only see the standard plugins . not the ones i supposedly loaded.. i see that the software looks like it loaded the "plugin-heal-transparency.py" (see screenshot of startup) but it is not listed in the plugin browser. neither is the "duplicate to another image" plug-in which i have included. the one SCRIPT i am using (jagged border) is showing up along with all the standard scripts and plugins however? i guess i just expect it to look like i had it before it stopped working.. is it time to try a unistall/reinstall?? Can you definitely say that the python plugins you installed are not showing in the Gimp menu system. Are they in the regular Gimp profile plug-ins folder? Do you have the Files -> Python-Fu console as shown earlier. If that is missing then something corrupted the Gimp installation. yes i am sure. i have already tried the searches you asked for and they are not there. also, i think you meant filters---->pyhton-fu and its not there where it used to be. i also checked file----->python-fu and its not there. i have included some screen shots proving this and 1 of my current user plugins folder as well as my plugin browser. sorry have no idea why it posted early?? Current time: 04-23-2019, 10:15 PM Powered By MyBB, © 2002-2019 MyBB Group.